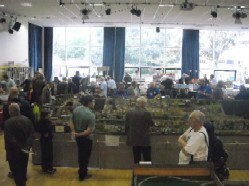 This year was our 51st Annual Model Railway Exhibition. This was our second year at St. Edwards School, and once again we were able to fill two spacious halls with a wide variety of layouts, traders and demonstrations. We also found a way to make use of the corridors too, with miniature railway rides! The only dampener (if you'll pardon the pun) was some rain on Sunday morning that refused to stay outside where it belonged and found its way into the sports hall, but apart from that unfortunate misadventure the exhibition was a success. We hope our visitors enjoyed the show which mainly demonstrated how much can be achieved on the smaller layout in a restricted space. Many thanks on behalf of the club to to all invloved in the planning, preparation and running of the exhibition, in particular the volunteers providing the refreshments that kept everyone going! Aythorpe St. Mary EM Gauge Fictional ex-GER branch, representing the changeover from LNER to BR. Originally built by Colin Wilson. Bovey Manor O Gauge Originally built as a test track for his own locos by fellow club member Don Neighbour. Branch Shed OO Gauge A small branch line engine shed. This layout demonstrates that it is possible to have a layout in a very small space. The Broadway 2mm Scale 7mm Gauge Trams Tram layout representing a town somewhere in East Anglia, but actually based on Ilford Broadway after the 1923 alterations, with a lot of modeller's license! Denton Ebsworthy OO Gauge BR Named for and dedicated to late section member, Dennis Ebsworth. Designed to show how relatively easy it is to build a small layout from easily available proprietary kits and models. 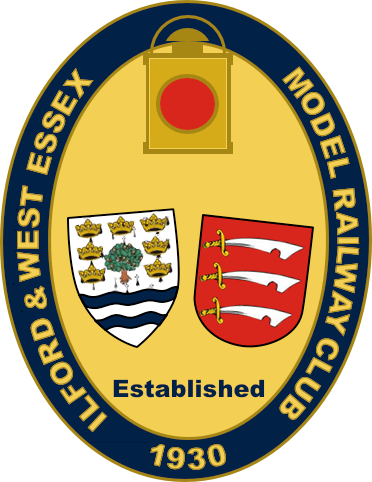 Eastham Works OO Gauge Represents a small wagon & carriage works on the GWR as once found throughout Britain in the 19th & 20th centuries. Emlyn Parva N Gauge Based on the GWR teminus of Newcastle Emlyn, with the 'Parva' added to make it sound more countrified. Fiddlers Green O Gauge Originally built by Colin Wilson and representing a light railway in Norfolk, Fiddlers Green has been 'moved' west by Frank to accomodate his preference for GWR. Hadley Green OO Gauge What is now the High Barnet branch of the Northern Line was once the High Barnet branch of the Great Northern Railway. This layout is based on the fiction that a) the intended extension to Potters Bar was completed, b) that an extra station was provided at Hadley Green and c) that the line was not taken over by the underground. Halcyon Days OO Gauge 3-rail Nostalgic layout (aka 'Grandads Three Rail') designed to recreate the Halycon Days of railway modelling, comprising Hornby Dublo, Trix and Triang 2-rail. Melbury N Gauge A circular N Gauge layout built on 3 levels, constructed with the object of testing what gradients and curves locos are capable of. Nant-y-glo Mine 7mm Scale Narrow Gauge Narrow gauge mining railway which takes coal from the mine and tips it into the waiting standard gauge wagons. Romerberg HO Gauge Trams Based on Romerberg in Germany after the wartime restorations. 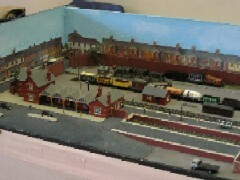 Sidney Street OO Gauge Depicting the remains of a station on the old North London Railway, on a projected - but never completed - line from Bow to Commercial Road. Singen Hbf N Gauge Prototypical layout depicting one end of a busy German central station near the Swiss border, operating cross-border to allow changes of locomotives between SBB and DB. St. Albans Abbey N Gauge Originally the northern terminus on the branch line from Watford of the LNWR, later becoming a junction with the building of the GNR line to Hatfield. Watney Street OO Gauge End-to-end layout based on an area around Nottingham in early BR days - late 50's to early 60's - so a mixture of steam and diesel are seen. Whistling Woods HO Guage Depicts an early logging line traversing the rugged terrain to gain access to much needed timber. This is actually a part of a much larger layout: Shaffons Crossing. The North American section also put on a display of stock, buildings and accessories in various scales, including a running G Scale display. Club Membership, Live Steam & Second-hand Sales The Club Membership stand, providing information about the club, raffle tickets and some interesting books and magazines for sale, plus computer and DVD displays. 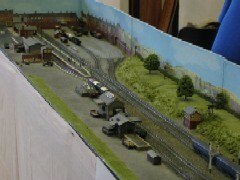 The Live Steam section displaying various 7¼ locomotives currently under construction by members. 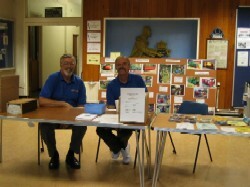 The sales stand with a wide variety of cub member's stock for sale. Geoff Gamble Books Extensive range of railway and transport related books and magazines. Lesley Lawrence Local artist specialising in commemorative and speical interest pictures to order. Ride On Railways Providing indoor train rides on their 5" gauge electric miniature railway. UK Train Sim Specialists in computer generated train simulation.